I have moved the Airship Resources to www.myairship.com in an effort to increase recognition of the site. I think that "myairship.com" is easier to pronounce and remember. And hopefully, the new address will further increase the number of return visitors. As a matter of course, all addresses which include the old "hotairship.com" domain name will remain operative for the foreseeable future. Please update your bookmarks! On Monday, 6 December 1999, the Airship Resources will be temporarily unavailable for at least three hours, most likely during the morning (Eastern Standard Time). The company which hosts the Airship Resources web site is moving its offices, which include over 150 individual servers, to a better location. Please accept my apologies for this temporary service outage. Update: The downtime ended up being about five hours but the move went well and the Airship Resources are back online. 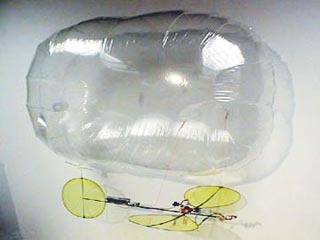 Gabe Baltaian has started a web site at nyblimp.com to offer his sophisticated indoor RC airships for sale. Gabe is a veteran RC modeler and he attends several RC shows every year. The site shows the great little blimps which Gabe builds, as well as those of veteran indoor blimp flyers Tony Avak and Mike Dodd. By showing the variety of aerostats participating in the indoor RC airship scene, Gabe gives you a special insight into the small group of enthusiasts who build these wonderful indoor-only lighter-than-air machines. Please see nyblimp.com for more information, pictures and Gabe's coordinates. According to the latest Goodyear press release, the GZ-22 "Spirit of Akron" which crashed ten days ago near its base outside of Akron, Ohio will be replaced by a GZ-20. The GZ-20 is a restored version of the blimps used by the U.S. Navy during World War II, simple and robust. The other two Goodyear blimps operating in the United States from bases in Pompano Beach, Florida and Carson, California are of that same type. For more images of the preparation of the new envelope and of the other Goodyear blimps, please see the Goodyear blimp image archives. 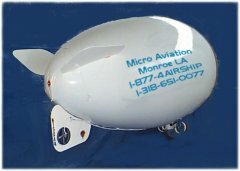 Micro Aviation in Monroe, Louisiana has been building and selling radio controlled airships for several years. 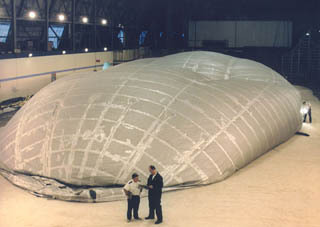 Their blimps are designed to be operated in convention centers and indoor sporting arenas. I have to admit that I am quite fond of their inverted-Y tail fin configuration. It integrates a fan into the lower fin which allows the blimps to turn on a dime, similar to the much more expensive Flight Brothers blimps. Please visit the Micro Aviation web site for more information (watch out for the heavy Java applet and loud music on their site). Every airship enthusiast has been waiting for this day. According to a press release dated 6 October, Vegas.com has been offering paid passenger rides in a blimp over Las Vegas since 21 October of this year. At a cost of between $180 and $240, passengers can get hourlong rides in the 10 seat Lightship A-150, the fourth ship of this size built by the American Blimp Corporation and operated by the Ligtship Group. 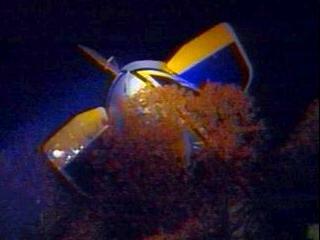 For images, booking information and the official press release, please see the Vegas.com Blimp Page. Update: The Akron Beacon Journal features a detailed article with eyewitness reports and two followup articles (first and second). For the record: The airship that crashed is actually the newest airship built by Goodyear Aerospace (now part of Lockheed-Martin). It is the only airship of the GZ-22 type to have been built. Registered as N4A it entered active service in 1987. The GZ-22 is much more powerful and sophisticated, but also more expensive to buy and operate, than the American Blimp Corp. A-60+ blimps which Goodyear has been leasing for its operations in Europe, South America and Australia. Please see the official Goodyear Press Release for details on the crash. Earlier this week, on Monday, 18 October 1999 at around 5:45 pm, CargoLifter's semi-rigid experimental airship "Joey" made its first flight. Piloted by Mats Backlin from CL's base South of Berlin in Germany, "Joey" flew several circles above the construction site of the new airship hangar before landing again 16 minutes after take-off. For further information and pictures, please see CargoLifter's web site. It was about time that I mentioned REVO Aerial Advertising Systems, a company that builds and operates radio controlled advertising blimps in all of Western Europe. Originally having started up in Southeastern Germany, they now have affiliates in several cities in and outside of Germany. The fact that they have added an international website in English (in addition to their German site) will hopefully help them to bring their airships and services to an even wider audience. Last week, I revised the Thermal Airship Directory to include thumbnail images of the airships instead of just technical data. Hopefully this will make the Directory a more entertaining destination for visitors which are not quite blindly obsessed with airships. Please note that I have not yet updated any of the factual information. The Helium Airship Directory has not been converted to the new format yet. I will undertake the revision as soon as I get the chance and hopefully also add several new airships which have been comissioned or re-painted in the last year or so. Please be patient with me, let me know what you think about the new format and keep sending corrections. Kubicek Balloons has completed and flown its second and improved hot air airship. The light blue 3,500 m3 (120,000 cu ft) Kubicek AV-2, registered as OM-ADV and advertizing the "Reprox" brand, made its first 20 minute flight on 26 May 1999 at the Brno airport. Many further successful flights have been made since, including several at the balloon festival in Kosice (Slovak Republic) in June and at the Czech Aeronautic Society's Balloon Show '99 in August in Svratouch (Czech Republic). (See the two web sites for additional pictures.) This is the first entirely new thermal airship design to hit the commecial market in almost a decade. Kubicek, s.r.o. has been increasingly successful in selling its balloons, mostly in Europe, due to its very competitive pricing. Exactly a week ago, Bill Arras and David Levin (USA) won the 1999 Hot Air Balloon World Championship in Bad Waltersdorf, Austria, flying a Kubicek factory demonstrator. The Airship Association has announced that the 3rd International Airship Convention & Exhibition, originally to be held in Telford (England), will now take place in Friedrichshafen (Germany) from 1 to 5 July, 2000. 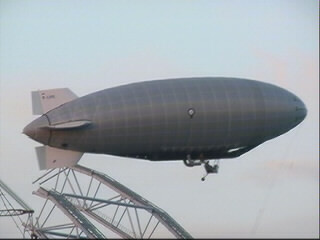 The move will allow conference goers to attend celebrations of the 100 year anniversary of the first flight of a Zeppelin airship in that same town on 2 July 1900. The union of this historical commemoration with the most significant conference on modern airship technology is guaranteed to be a success. Nobody will want to miss this opportunity. For further details about the conference, please see the official announcement by the Airship Association. SECAP, the Solar Airship Program at the University of Virginia, has updated its web site with new information about Aztec, its second (unmanned) solar airship. According to the SECAP web site, "Aztec is the second iteration of the UVA Solar Airship Program's Advanced Airship Design (AAD) program. [Aztec] is being built to correct the problems encountered in the first AAD airship named Dunkin -- namely stability and control. [...] The purpose of Aztec is to demonstrate controlled flight and solar powered capabilities in an airship." This program has been going on for over five years. It is very well managed and apparently well funded. But above all, the students involved are consistantly driving this program to new technological achievements. Make sure you to pay a visit to the SECAP web site. For next year, the Zeppelin (Centennial) Tour 2000 is to be one of the great airship events to come. The Lighter-Than-Air Society, one of the major international airship organizations, is sponsoring this airship-themed tour to Germany in the summer of the Year 2000, to coincide with the 100th anniversary of the first Zeppelin flight. Offered as an encore to the LTA Society's successful "Zeppelin Museums Tour" of 1996, "Zeppelin (Centennial) Tour 2000" is scheduled from from 22 June to 5 July 2000. Lasting 14 days and 13 nights, the focal point of the tour is a visit to Friedrichshafen to partake in the town's commemorative Zeppelin Centennial celebrations. For more information or to sign up, please visit the LTA Society website. Talking about anniveraries, former chairman and now regular member of the board of American Blimp Corp. Jim Zaccaro informed me that N560VL, an American Blimp Corp. Lightship A-60+ (c/n 005) recently achieved 10,000 hours of service. The airship was built in 1991 and has literally been around the world. After it completed its long-term commitment with Russell Stover Candies, it began a new promotional tour with Monster.com, a job search company, in Boston in July. As you may have noticed, I recetly redesigned the main index of the Airship Resources. The most functional addition is a Search Field which allows you to search the entire contents of this site. I hope you find this feature useful. Over the next several weeks, I will be migrating the entire site to the new design. During this time, please be patient with me, as broken links and other minor problems occur. This weekend, I went to watch the 4th of July (the U.S. National Holiday) fireworks in New York City from the Promenade in Brooklyn Heights. This position allows you to see the fireworks against the backdrop of the Manhattan skyline, enhancing the spectacle by adding reflections of the fireworks in the glass facades of the skyscrapers. As those of you who were there may have noticed, the Tommy Hilfiger Airship, a Skyship 600 operated by Airship Operations Inc. passed by just after the last rocket went off. It was displaying various messages on its nightsign system emphasizing the Tommy Hilfiger name. This was the first time I have witnessed a Skyship 600 and I was struck by how much larger and more visible it is than the comparably tiny but more economical Ligtship A-60+. I have solved the question about the mysterious ultralight blimp in the last news update with the help of "Building Small Gas Blimps", an excellent book by Robert Recks which I hope to review here in the next several weeks. The two person airship with twin tiltable engines was developed by Bill Meadows and his company U.S. Airships International in Statesville, North Carolina. In fact, the lifesize gondola for the airship was displayed at last week's AIAA Conference. Developed and refined in over 10 years of meticulous work, the ship was advertised as being available for purchase at US$250,000. Hopefully, I will be able to provide more detail about this promising small airship as time goes on. Finally, Prospective Concepts AG, the Swiss company that has developed and tested several pneumatic wing structures, i.e. inflatable airplanes, has set up its official website. The Stingray is especially noteworthy since there is the possibility of transforming a larger version of it into an airship hybrid by filling it with helium.